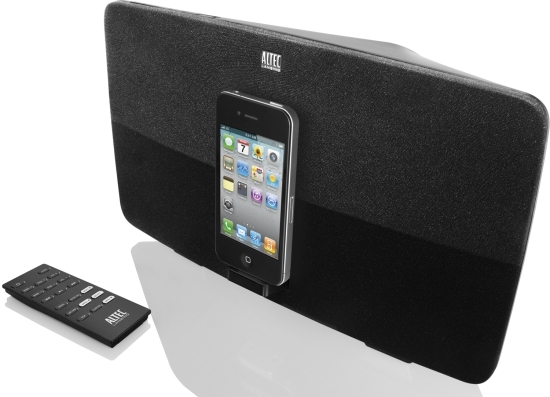 MILFORD, PA – April 5, 2011 – Today, audio innovator Altec Lansing introduced the new Octiv 650 docking speaker system for the iPhone and iPod touch, marrying minimalist design with powerful performance. Destined to be an integral piece for any living space, the Octiv 650 delivers broad spectrum audio while displaying full screen video from an iPhone or iPod Touch on a TV screen. Utilizing Altec Lansing’s free Music Mood app, users can unwind with a number of soothing pre-loaded videos and sounds. With discreet lines and a flat front panel, the unique wedge shape provides room-filling, crystal clear sound without taking up much space. Powerful, well balanced audio is delivered through two 3” full-range drivers and a nested 4” subwoofer for deep bass. The attractive yet simple design blends seamlessly with almost any décor. To enjoy streaming video with immersive audio, users can watch full screen Netflix™ movies and YouTube™ videos on a television from an iPhone or iPod Touch using the Octiv 650 component and composite video out jacks while enjoying superior sound quality. For greater song selection and to further expand home theater versatility, a second audio device can be added through the auxiliary input. A full-featured remote lets users control the audio and navigate their device from across the room. To help ensure a call is never missed, the Octiv 650 automatically pauses when a call is received on an iPhone. No matter what the desired mood, the Octiv 650 can help set the tone with Altec Lansing’s free Music Mood app. Users can watch and listen to a number of serene videos and sounds such as a crackling fireplace or a calming river stream with the app’s Ambient Sound and Visual Library. For additional customization, the user can pair each video to their audio counterpart and let the full package work its magic. Also included within the Music Mood app is a graphic equalizer (EQ). From basic and preset options to a more advanced seven-band graphic EQ, customized sound can be saved and accessed at the user’s discretion. The Altec Lansing Octiv 650 will be available in May 2011 at www.alteclansing.com in black and slate. MSRP is $199.95.